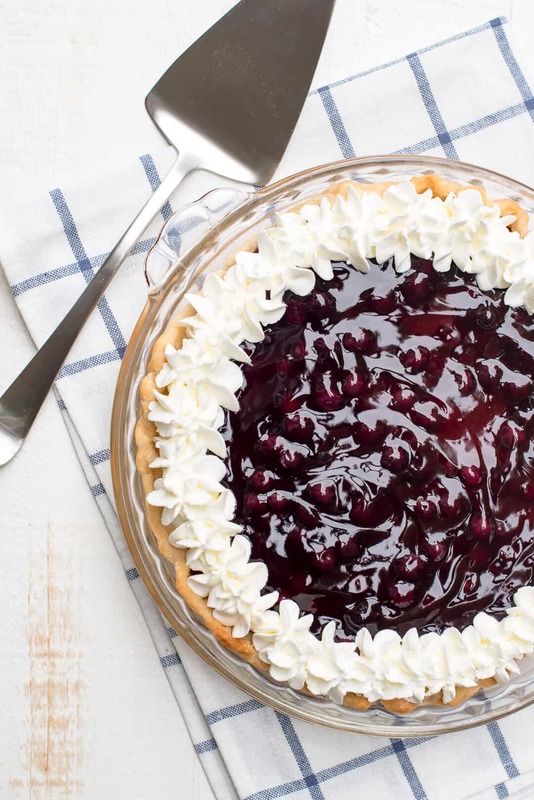 The filling in this Blueberry Lemon Sour Cream Pie is absolutely heavenly. A creamy, totally luscious summer dessert. It’s been a challenging week in our house. I had planned to share this heaven on a plate with you all several days ago but life happened and I had to do some reprioritizing. On Sunday evening, as I was still floating on a cloud of royal wedding bliss, my husband was struck with kidney stones and had to go in for a surgical procedure just a few days later. Needless to say, he has been my focus for the last week and the pie had to take the back burner. I’m a firm believer in avoiding the discussion of medical issues and recipes at the same time so I’ll move on but if you’ve had kidney stones or have even been near anyone with kidney stones, you know what the poor guy has gone through. Although it was pretty darned painful, my heart is full of gratitude today and love for all of you out there going through your own struggles, health related or otherwise. He’s recovering nicely and we have pie. Life is good. 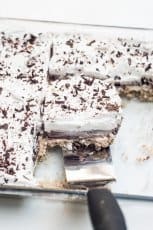 I’m going to give you several options for making this recipe easier or you can go completely from scratch the whole way through. Either way, it’s going to be delicious. Use a store-bought crust. I did! You can buy packaged pie crust and blind bake it yourself (my instructions for this are included on the recipe card below) or buy a pre-baked crust that is ready to go to make it even easier. 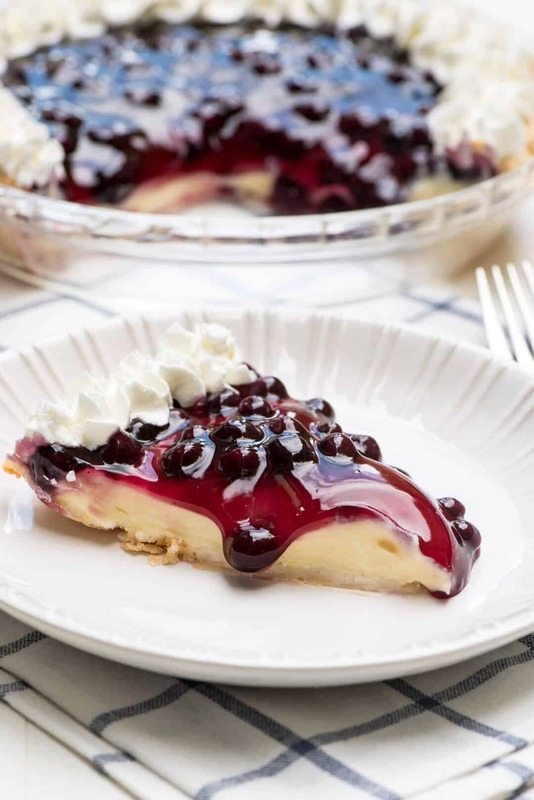 The pie is delicious with a traditional crust OR a graham cracker crust. 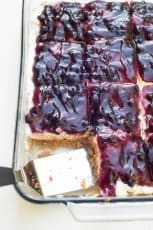 Use canned blueberry pie filling for the blueberry layer. I did this as well. 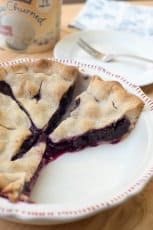 You can cook fresh blueberries down to make your own homemade blueberry pie filling but this week I was ALL about one less pan to clean and canned blueberry pie filling is a wonderful shortcut. The whipped topping can be good ole’ Cool Whip or whip your own fresh cream with a little powdered sugar. I made my own but only because I had a good amount of heavy cream sitting in my refrigerator that needed to be used. Otherwise, I’d happily grab that Cool Whip. The lemon sour cream filling is cooked quickly and easily on the stove and poured into the baked crust. It’s got plenty of lemon juice and zest and the sour cream gives it a creamy, lusciousness. It is SO wonderful. 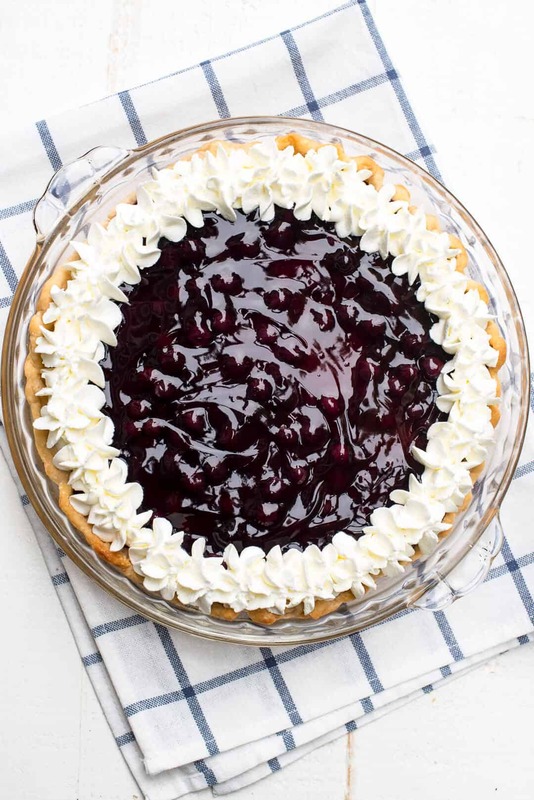 I like to refrigerate the lemon filled pie crust for a couple of hours and then spoon the blueberry pie filling over the top and decorate it with a little whipped cream. I spooned my freshly whipped cream into a pastry bag and piped it on to the edge of the pie with a 1MM decorating tip. I just think this pie is so festive. Just perfect for Memorial Day weekend or your upcoming 4th of July festivities. A little messy, a lot delicious. I hope you all have a fabulous 3 day weekend filled with friends, family, fun, and amazing food. P.S. 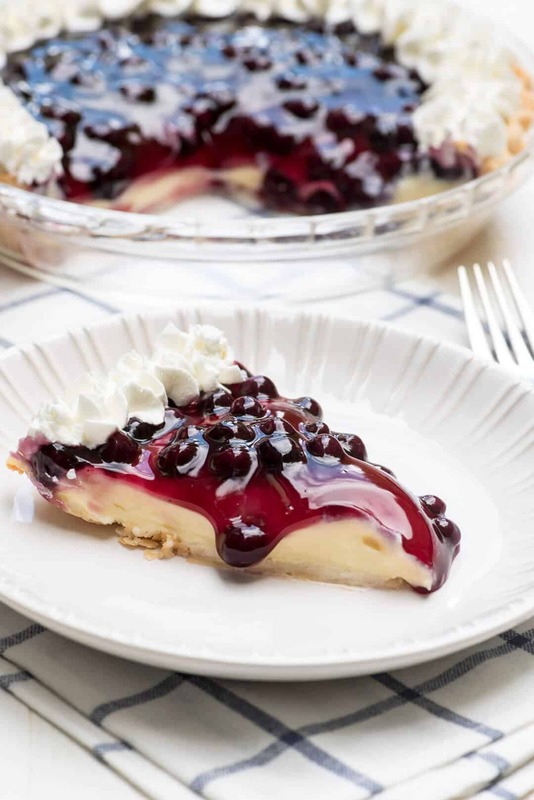 – For another delicious idea, check out my Easy Blueberry Cheesecake Dessert. Add sugar and cornstarch to a heavy saucepan. Set heat to MEDIUM and whisk in the milk, lemon zest, and lemon juice. Add the egg yolks in a thin stream, whisking vigorously, and cook until thickened. Remove from heat and stir in butter until melted. Allow mixture to cool to room temperature. Stir in sour cream and pour filling into pre-baked pie crust. Refrigerate for an two to three hours until well chilled. 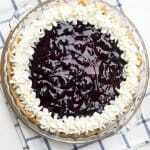 Spoon blueberry pie filling over the top and spread out with an offset spatula or the back of a spoon. Use a hand or an electric stand mixer to whip the heavy cream for 2 or 3 minutes, until beginning to thicken. Add powdered sugar and whip again until stiff peaks form. 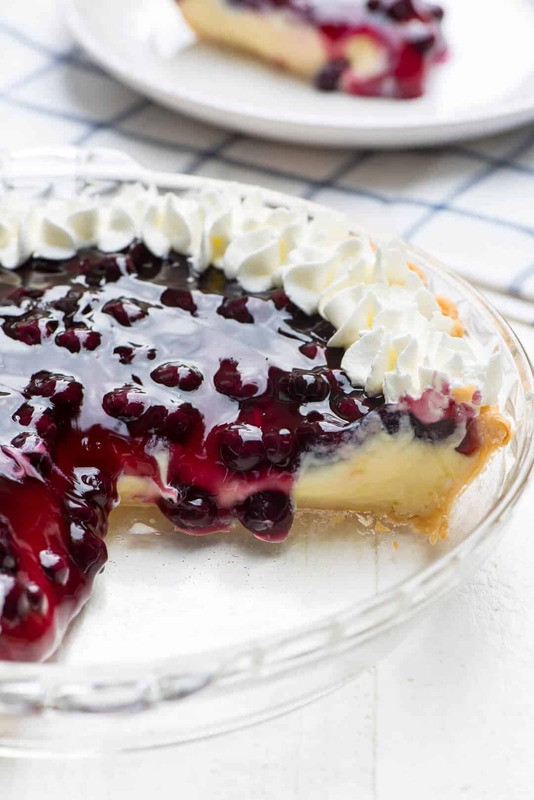 Decorate the pie with the whipped cream, as desired, and serve. 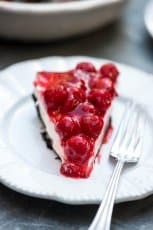 Preheat your oven to 450 degrees F. Place your homemade or store-bought pie crust in a 9" deep dish pie plate and press the top edges out and fold them over to create a thick top edge. Flute the edge with your fingers or a fork, as desired. Line the crust with a layer of heavy duty foil or parchment paper and add a thick layer of dry beans, pushing them out towards the edges of the crust. This will weight the crust down as it bakes and prevent the edges from falling inward. Bake for 10 minutes. Remove the beans and foil and continue to bake for an additional 2 minutes, or until the crust appears cooked through and lightly golden brown. Remove from oven and cool to room temperature before filling.